Charitable giving is often associated with tax planning. And seniors age 70½ and older may benefit from a unique provision of individual retirement accounts (IRAs) when making a gift. The so-called charitable IRA rollover provision allows seniors to donate withdrawals, including required minimum distributions (RMD) totaling up top $100,000 annually, directly to a qualified charity, without generating income tax. Originally introduced in 2006 as part of the Pension Protection Act, the provision became permanent in 2015.
Who may want to consider the strategy? Taxpayers who claim the standard deduction on tax returns, since they do not benefit tax-wise from charitable contributions. Individuals who plan to make a sizable charitable gift. Charitable deductions are limited by a taxpayer’s income — generally up to a maximum of 50% of modified adjusted gross income (AGI). 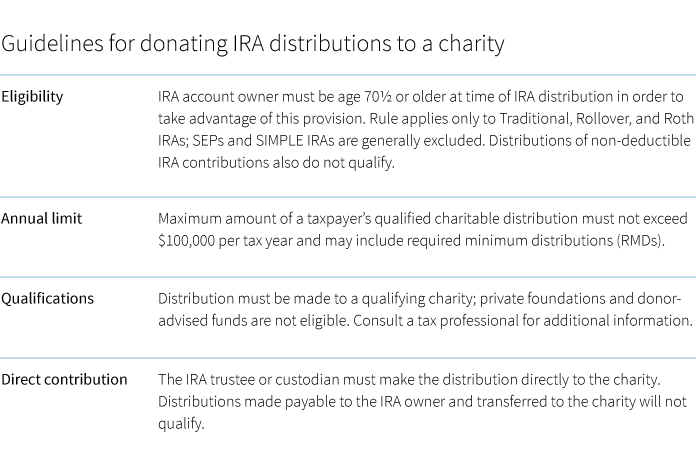 By directing an IRA distribution to a charity, individuals can avoid the restriction. Taxpayers who want to lower their AGI by not taking the RMD as income. The AGI is a trigger for many provisions in the tax code, including taxability of Social Security benefits, determination of Medicare Part B premiums, and phase-outs for certain deductions and tax credits. As year-end approaches, advisors may want to reach out to investors who must take RMDs. Investors may want to avoid taxes on their RMDs while supporting their favorite charities. It is also important to note that qualified charities for this gifting provision do not include private, non-operating foundations, donor-advised funds, or charitable trusts. Advisors may also want to remind local CPAs, attorneys, and non-profit board members about this IRA provision, and consider partnering with a local non-profit organization to hold an event to educate donors.